There is a stereotype of Mexicans as being lazy and taking siestas all the time. The classic image would be a Mexican character sleeping under his sombrero. More modern variations of this stereotype might involve Mexican and Chicano characters who don't care that they're on welfare. The two main reasons for this trope are a relaxed sense of time that Mexico is reputed for and the siestas. In cartoons, the Mexican will typically (and illogically) be sleeping against a saguaro cactus, which are only found in the Sonora desert of southern Arizona in the southwestern USA and Sonora in north-west Mexico. Although Mexicans are the people most commonly perceived as "lazy" in popular culture, indeed mostly because of the siesta behavior that originated in Spain, this stereotype may apply to other Latin American countries as well as Spain, Portugal, and the USA territory of Puerto Rico. This can sometimes apply to countries on the Mediterranean and Southern Europe, not just the two on the Iberian Peninsula. Even Southerners get the lazy portrayal sometimes, because of the American South's reputation for a more relaxed sense of time than the faster sense of time that the Northeast is reputed to have. It is also usually people from the North(east) who call people from the South lazy. Also, the lazy stereotype is also common to the USA as a whole. The warmer climates in all of these areas made ceasing activities during hot afternoons necessary, at least before air conditioning became widespread. Lucky Luke album #3 "Tortillas for the Daltons" features this in spades. There is an entire city in which the population did nothing but resting even when the criminals arrive to kidnap someone. It even turns out that a bank owner would make a party because his bank will finally be robbed. That being said, the biggest bandit group in Mexico from this comic book is a notable aversion, but you can understand that it is the biggest bandit group in Mexico for a reason (even if they are unable to rob banks). In a The Three Stooges short, the guys are in Mexico looking for a woman named Esther. Every time they ask if anyone's "seen Esther", they think they said "siesta" and go to sleep. One man who's particular grumpy about being disturbed from his nap gives directions in Spanish on how to get to the nearest river and advises the Stooges to drown themselves and he goes back to sleep. In the book Frank Merriwell Down South, an acquaintance of Frank's apparently dies some miles out of a Mexican town. The heroes ride into the village and roust up an undertaker who vociferously complains about his siesta being interrupted and whines about the extra work all the way out to the shack. The body isn't there any more, but our heroes don't apologize to the undertaker. Seinfeld. Invoked in one episode where Elaine invents the Urban Sombrero — two different men who received them as gifts got fired from their jobs because their bosses caught them sleeping on the job. Both men claim they've snuck a mid-day nap for years, but it wasn't until they wore their Urban Sombreros that they got caught in the act, and were fired as a result. In Top Gear the guys invoked these tropes when joking about a Mexican sports car, and Richard Hammond in particular went far too far in "Joking" about them leading to the Mexican Ambassador to the UK making an official complaint. It didn't help that some of the jokes were about him. The George Lopez Show: In "George Can't Let Sleeping Mexicans Lie", George feuds with a new neighbor over his "sleeping Mexican" lawn ornament (which he claims that it was made by Mexicans in Mexico). In an episode of Get Smart taking place in Mexico a showdown with a bad guy takes place while a man is taking a siesta in the background. It turns out that it's the Chief in disguise giving Max some invisible backup. In the western-themed Desperados: Wanted Dead or Alive, the former Bandito Pablo Sanchez has a special ability which allows him to attract unaware enemies by pretending to have a siesta in the open. In South Park: The Fractured but Whole, when we first see PC Principal, he just punched a man for telling a hispanic coworker that he "looks tired" because he claims it's a microagression that enforces the Lazy Mexican Stereotype. When said hispanic coworker tells him that he IS feeling tired, PC Principal punches him as well. Subverted however with Butters' Minion that he can summon via whistling for him and act as an extra teammate for three turns. Consuela, the Mexican maid who is (according to Word of God) based on one Mike Henry's former maids, is lazy, prone to theft, not especially helpful if it means extra work, goes home to an overcrowded house with an impossible number of residents, and very passive-agressive. She even refuses to work at times. The "Mexican G.I. Joe" character is a lazy, unshaven, paunchy, cigarette-smoking man who tries to sell the kids overpriced crap. Bumblebee man from the The Simpsons is a Captain Ersatz of the main character of El Chapulín Colorado. When not doing unfunny slapstick comedy, he's usually depicted as sitting down and being idle or using the lazy stereotype in some other way. Speedy Gonzales from Looney Tunes was created to be a Stereotype Flip of this trope, being a hyperactive and very fast Mexican mouse with a Meaningful Name. However, most of the other Mexican mice in his cartoons would seem to fit this trope, especially Slowpoke Rodriguez. 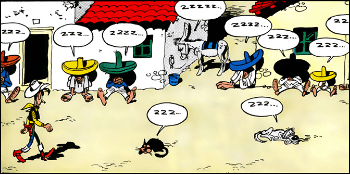 In "Mexican Boarders", Speedy tells Sylvester, exhausted from chasing the mouse, that he is going to take a siesta. Lampshaded in the "Mucho Loma" story arc, which is set in the fictional town of Mucho Loma (fake Spanish for "Much Mud"), where all of the citizens are constantly in a state of exhaustion from wading through the mud all the time. In fact, singing is a crime worthy of jail time because it disturbs the townsfolk (namely the sheriff) when they're sleeping. South Park. In "Death Camp of Tolerance" the kids are at one point taken to "The Museum of Tolerance" and shown a bunch of wax figures representing ethnic stereotypes. One of the parents points to what he thinks is the "Lazy Mexican" stereotype, which turns out to be just the janitor taking a nap. Izzy Gomez from TUGS is a Mexican banana tramper who is very lazy and often falls asleep. He does not like when the tugboats wake him up to try to tow him into Bigg City Port for a good price, and would rather sneak into it for free, which is both illegal and extremely dangerous. Not to mention, if he got caught by the Coast Guard, he would have had to pay a hefty fine anyway for trying to sneak in without a tow. Scooby-Doo! and the Monster of Mexico: Subverted. Shaggy is initially excited at visiting Mexico due to the cultural tradition of taking Siesta's, until Velma explains why they happen and he's repelled at the idea of hard work. This is the only time the idea comes up in the entire film. The siesta originated in Spain and Portugal and was exported to the Americas with colonisation. In Iberia, the southern European summer can be hot and oppressive in the afternoons. So much so that it is an accepted part of daily routine in Spain for everything to close down between midday and about three as there is no real point in working: it is accepted that people will have a light lunch and then take the siesta for several hours. Spanish and Portuguese people compensate by extending the working day to perhaps seven or eight in the evening, preferring to work in the cool of late afternoon and evening. Scarcely "lazy", as the missing hours are compensated for — and pragmatic, too. Mexicans, also inhabiting a hot dry climate, learnt from experts. The siesta is less prevalent in northern Iberia, where the climate is gentler and afternoons are not quite so hot. Also happened in real life on the set of El Mariachi, where, if you look close, you can find sleeping man (technical advisor from the real police station who was assumed to control the use for real guns in this very shot!) on a street. Truth in Television as it was really filmed in Mexico. In Asterix in Spain, Asterix visits Spain, where several jokes are made about the supposed Spanish laziness. At one point, for instance, they travel over a bad road. Asterix complains about it, but his Spanish companion tells him: "Yeah, it's bad now, but in a few years you'll see it will be much better." As he says this there is one Spaniard calmly working on the road, all by himself. The underlying joke is that even today Spanish roads are still bad and the authors suggest it is because the Spaniards are just too lazy to do something about it. Chappelle's Show featured a skit styled as a documentary series about racist animals on film, ending with a preview of the next episode, about racist cars, showing KITT saying that Puerto Ricans are lazy.